Throwback to the 1970s: Hindi movies capturing the romanticism of Bombay (as it was known then), sheets of rain pelting down, drenching a young couple as they attempt to tame a misbehaving umbrella on an empty, wet stretch of road. Just then, cutting through the grey montage, a sleek black and yellow automobile whizzes across the screen like a knight in shining armour. Not quite the Batmobile, but our very own Premier Padmini plying as a taxi, coming to the rescue of the sodden pair. So much has changed about the city since then. Empty roads? Not a chance! One thing that’s remained constant though, are the Mumbai cabs. Lackluster and weary yes, but still very much part of the city’s culture. At ‘Taxi Fabric’, Sanket Avlani, along with his designer comrades, is attempting to give the taxis a facelift by refurbishing their interiors. No idle makeover, the idea is to initiate a dialogue between the driver and passengers about design as a medium of impact. Each design has a story to tell; Avlani weaves a tale around the infamous dabbawallas who have a cult following of their own! Gaurav Ogale chose to depict snippets from a taxi driver’s life, while Pavithra Dikshit’s Urban Garden conveys through brightly coloured flora, the vital importance of green cover. You can almost smell the lemons and jasmine, so alive and verdant is her creation. History gets its due with Kunel Gaur’s A Century of Revolt – a homage to those who fought for India’s independence. Fresco-like images of freedom fighters float on the cab’s ceiling, unshackled and unfettered in a free India of their dreams. When Samya Arfi, a Pakistani designer was asked to create a piece to commemorate the independence of both nations, she picked hand gestures and geometric patterns to portray our commonalities. Titled Monad, you can catch Chris Martin hitching a ride in this taxi in the Coldplay video, Hymn for the Weekend. 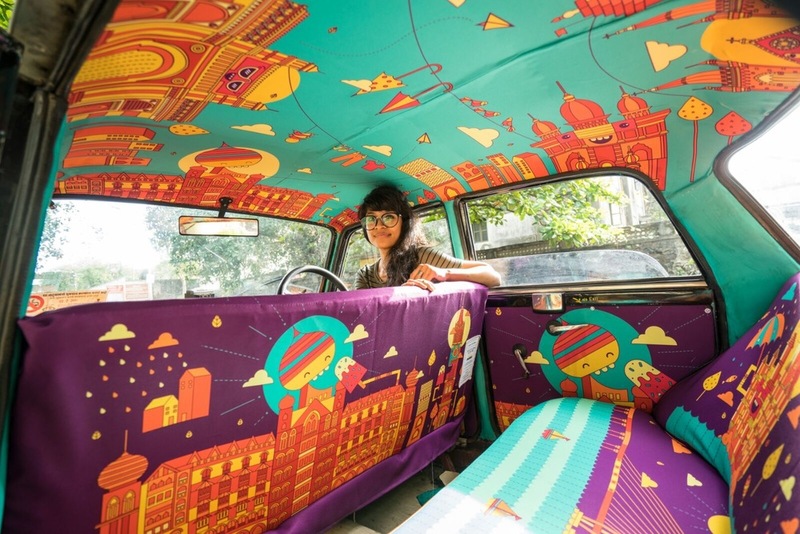 Taxi Fabric began a campaign this August through Kickstarter to raise resources for beautifying another 30 cabs. After printing and stitching, the fabric is fitted onto the seats, door panels and ceiling, and even the dashboard is refreshed with a facelift. No wonder several taxi owners are flocking to have their office-on-wheels upgraded. Musty browns and murky maroons have given way to psychedelic colours, plush upholstery and art in motion. Mumbaikars, are you ready for the joyride? Get an update every time a new taxi is fitted out with fabric by following the project on Facebook, Twitter and Instagram.